For many many years we have gathered together to shift and transform through the breath in a co-creative container that has been in part, formed by the lovely soul known by so many as Prem Baba. Every closing has been deeply mystical and powerful, rooted in source and translated from Portuguese into English. What many have not known is that the “hinario” or hymn that we have closed with was written while being sung to the Ganges River in Rishikesh by Prem Baba himself. In January of 2017, I was planning a journey with the intention of receiving some much needed healing for myself. I had just lost the 3 most influential and important people in my life to cancer. Little by little I was completely take apart at the seams. I had never sat with my two of my favorite teachers who are still “in body” and I knew deep down that it was time to prostrate myself at the feet of someone who could “see through me”. My first “go to” was Ram Dass who’s retreat in Hawaii had a waiting list 100 deep. I researched my other “top picks” and found that the Prem Baba Sanga was offering a silent retreat in the hills of the Himalayas so I quickly registered. Simultaneously one of my dearest friends, who is no doubt the finest Western student of Peruvian, Shipibo teachings I know was planning a retreat to Terapoto for a 21 day dieta. 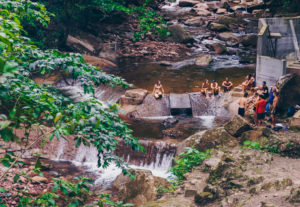 Due to a lag in response from the “silent retreat” registration team and my desire for “intense cleansing” I booked the trip to travel with friends to Peru. I was heart broken not to have made the decision to travel to India to see Prem Baba but the journey inward that my time in the jungle provided was just the push I needed to clear and process the losses I had incurred and replace those voids with the “internal self love” required to open up enough to really “see” my life again. Upon returning to the states, much more unfolded. The work was not yet close to complete and I had not yet even begun to establish contracts for the 2017 season. Maybe it was time to take a break from the work, put the chacapa and microphone down and get a job at Walmart? I don’t quite know where I was at that point but erasing any memory of what I had become which was inauthentic or illusionary while in Peru had invariably been completed and I was working with a blank slate. The first call I made was to Sridhar Silberfein. 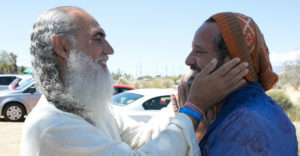 For those of you who do not know Sri, let me first say anyone with as big of an appetite for sharing divinity with others, who serves in the way he does cannot possibly please and hold the patience required for the amount of egos and attitudes that this guy does without going completely mad. He is largely responsible for brining many Hindu Saints to the West including but not limited to Amma, “the hugging saint” who sees hundreds of thousands of people per year. Even though he was traveling abroad, he still had time for me and communicated in a timely manner through his staff. I shared with him I had just been cracked open and that I had no contracts for his infamous Bhakti Festivals for the 2017 season. 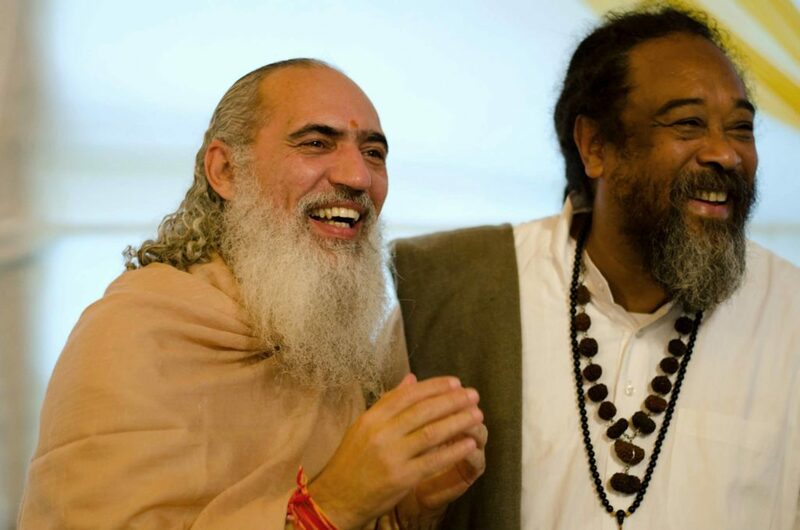 It was within the next few weeks following that I would come to learn that not only would we be included in both the May and September festivals, but none one other than Prem Baba himself would be traveling to the United States to facilitate satsang in the very same room that we have been singing his songs for the past 6 years. I was over the moon! I would still get to sit with him but he would be coming to me! LOL, when it all seems as if it i falling apart, more often than not, it is falling into place. I did get to sit with Prem Baba and actually was gifted a private meeting with him before his final teaching at the festival. Thank you to the loving souls who facilitated this for me. It was literally a dream come true. More important than anything else was his teaching. Oh the way baba works is incredible! I love that many who do not yet understand the internal methods for liberation have still to look forward to their awakenings. Like tasting a fabulous dessert before it is served to your family knowing it is going to blow everyone away! He weaved a share that began “God Head” deep and yet held so much joy and playfulness, to not get cracked wide open by the sheer exposure surely suggests of deep, “pain body” or simply exposure to the wrong teacher. But what teacher who is so adept at love could be wrong? He spoke primarily of relationship and how the most challenging shift at this time in the true “seekers” evolution is the transition from suffering to joy. Simple? Maybe not so much. It may seem simple to some but the energy that is required to stay present moment to moment can be daunting. Why? Simply because we are programable beings and much of that has been up and to this moment, suffering. Baba explained of the instrument of gratitude and how if we account for the present moment, that there is nothing but “peace”. Then he gave a simple yet profound tool. “Stop Complaining” he said gently in Portuguese. Then remarked, it is not easy because our default is to suffer. Just to begin to notice the frequency and programed baseline of complaint that I generate is a profound reflection. It is one slippery slope but one I plan to traverse with great attention and intensity. Life is great here in the now and I do not want to take that for granted. It can change at a moments notice. I send love and support to those who are working through injuries and the loss of loved ones, depression, hopelessness and just general dissatisfaction. I will the day to come where all of my thoughts are as present and conscious as when I focus to create healing and peace. We are all just walking one another home and I want to be a great date! I am so very grateful for this beautiful life and I praise our journey and awakening together as one. Thank you to everyone who made this year possible and blessings beyond compare to our sacred guardian team!